"frank williams" (frank002williams@gmail.com) has contacted you from your profile on biz.PRLog.Org. My name is frank williams, 24 years from Sierra Leone. My father and I escaped from our country at the heat of the civil war after loosing my mother and two of my senior brothers in the war. He was in Buake, a northern city to negotiate for the purchase of a cocoa plantation when he was shot and killed by the rebel troupes fighting to take over the Government of the country on the 22nd September, 2002. I need you also to assist me with a letter of invitation as come down and complete my education while you mind the investment. I will give you 15% while 5% is made for expenses. E-mail: me frank002williams@gmail.comso that we can discuss further. In my last post, I talked about my CIBC AC Vonversion Visa Travel credit card that was hacked. Since then, there were 2 other credit cards that were compromised. One of these two cards had one fraudulent charge and then their fraud detection system shut off the account. The other credit card had about 20 attempted fraudulent charges that were coming from all across the globe, but none of them was successful. I was puzzled, as there was no connection between these three cards. I never had them together in my wallet or purchased online, one card had only one transaction 4 months ago and the other card had only 2-3 charges at an electronic store and groceries. The connection became clear to me when Equifax declared that there was a huge data breach that affected 143 million customers. I have plausible reasons to believe that all my affected cards were scammed because of the Equifax breach; the time frame matches and it makes so much sense because that’s the only connection I can see linking these 3 cards together. Credit card reporting companies like Equifax will never tell you the real story. They won’t tell you up to what level or exactly what sort of information from your files was leaked, or how many credit cards or clients were leaked. They are vague providing any information and I do not trust them with the information they are providing. Also, how can you trust someone who broke your trust in the first place by failing to protect your valuable information? 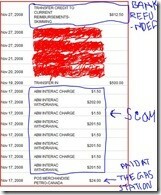 About 2 weeks ago, I found out that my CIBC AC Prepaid Visa card was compromised. However, this card was never stolen or lost. When trying to load my card online, I noticed scammers made 9 fraudulent transactions. The small transactions were made via PayPal and 2 large transactions were made from Malaysia. One of these was Expedia Malaysia and the other one was an airfare purchase from Malaysia. CIBC is not the back office for this card. A third party prepaid credit card provider I2C (http://www.i2cinc.com/) in California is the back office and provides support maintaining this card and they don’t take calls, so I had to talk to CIBC customer service and file a complaint form. I was told that it could take up to 40 days to complete the investigation and reverse those charges. The reason I use this card is because I can control how much credit availability the card can have and it’s especially handy when you are travelling. So scammers were able to extract only around $200 due to low availability. What surprised me most is that I2C’s fraud detection system totally failed, as there were 9 transactions and they raised no flags whatsoever. In the past, I dealt with fraudulent activities on my credit cards and their systems flagged and blocked my cards after 1 or 2 transactions. After 9 transactions, my AC Conversion card had no more balance left for the scammers to take out and that’s why it stopped. No fraud detection system stopped it. I will link a video I made on this on the top left and here: My Travel Visa Card Was Compromised. I will give some tips to help you protect yourself from credit card scams in that video as well. Take out your credit card from your wallet and look on the back of your card; you will see a 3 Digit PIN Number. You need this number to purchase online. This number works as a security shield. Online merchants will ask you this number to verify that you are the real owner. If someone hacked your information and trying to put through online purchases, they will not have this 3 Digit PIN Number as only the actual card holder can get this number by looking at an actual credit card. That's why the con artist on the other side of the phone is desperate to get this number from you. Let me construct a mock conversation to give you an example, so you know what to expect from con artists. Remember, each situation is different and scammers will come up with new techniques to trick you. The phone call you will receive may be very different than this example. Always use your common sense as your guide to protect you. A. Dawn: Oh no! I haven't used this card for a few months! Mr. Con: No worries, Mr. Dawn. We have been watching this company for some time, and we will block its transactions and will start a fraud investigation. We will credit your account for this trade and will issue you a new credit card. Let me read your credit card information to you to make sure this is the right card. A. Dawn: Yes, that's right. Mr. Con: Now, Mr. Dawn, let me give you my employee ID number at Citi Bank Master Card and also, I will give you a case number for this investigation. You need to write this down. Do you have any questions on anything Mr. Dawn? A. Dawn: No, thanks. You guys are very active and helpful. Mr. Con: Thanks for being a loyal customer. Before I go, for security reasons and your own protection, I need to verify that you are in possession of your card. There is a 3 Digit Number on the back of your card. If you could read that number to me. Mr. Con: That is absolutely correct. Thank you for you time Mr. Dawn and have a nice day. Mr. Con just got a hold of the missing piece of the puzzle, and he will start placing online purchases without delay. The best course of action to protect yourself from telephone scams would be to subscribe to Caller ID and screen your calls with voice mail or an answering machine. If you don’t recognize the phone number on your Caller ID, don’t pick up. Urgent callers will leave a message. If you believe you have been a victim or someone has tried to scam you, call your local RCMP Detachment or the police service of jurisdiction in your area. Remember, common sense and vigilance are your best defense.